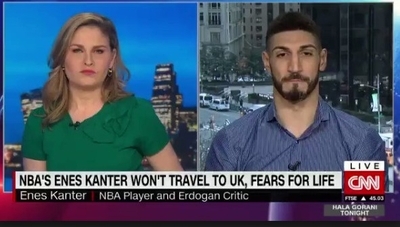 Turkish NBA star Enes Kanter did not join his New York Knicks teammates when they play the Washington Wizards in London today due to his fear he could be assassinated by Turkish spies. An Istanbul prosecutor on Tuesday drafted an extradition request and an international arrest warrant, known as an Interpol Red Notice, accusing Kanter of supporting the Gulen movement, which Turkey's ruling Justice and Development Party (AKP) refers to as the Fethullah Terrorist Organization (FETO). The Gulen movement is a global Islamist movement headed by Fethullah Gulen, who lives in self-imposed exile in Pennsylvania. Turkish President Recep Tayyip Erdogan and Gulen once were allies. They had a falling out in 2013 after a Gulen-linked prosecutor in Istanbul opened a corruption investigation into individuals linked with Erdogan's Justice and Development Party (AKP). Erdogan accused the Gulenists of running a "state within a state." Turkey accuses Kanter of financing Gulen's movement, which the Erdogan government blames for an attempted coup in 2016 that Turkey's military quickly repressed. The government responded with a massive crackdown, arresting tens of thousands of journalists, academics, alleged Gulen supporters and others. Turkey now is considered the world's worst jailer of journalists. Erdogan has repeatedly lobbied the United States to extradite Gulen ever since, but U.S. officials say he has not provided sufficient evidence. Still, the Trump administration reportedly is considering the request to send Gulen back to Turkey. Despite Erdogan's abuses, Kanter's plight has not generated any attention from American Islamist groups, including the Council on American Islamic Relations (CAIR), the Muslim American Society (MAS), and Islamic Circle of North America (ICNA). That might be surprising, since the same groups held tributes for murdered Saudi Washington Post columnist Jamal Khashoggi, expressing outrage at Saudi Crown Prince Mohammed Bin Salman for orchestrating his brutal murder in the Saudi consulate in Istanbul. "The best form of jihad is a word of truth against a tyrant ruler," former MAS President Esam Omeish, a board member at the Dar al-Hijrah mosque outside Washington, D.C., said at last month's MAS-ICNA Convention in Chicago. "...When [Jamal Khashoggi] saw the best of Saudi Arabia and the best of his companions being jailed and tortured. He realized that he can't live in a society where he can't speak." The same could be said for Enes Kanter. But it hasn't. Like Khashoggi, Kanter is a U.S. resident and a Muslim. Both have drawn the ire of authoritarian rulers of Muslim-majority states because of their beliefs. CAIR touts itself as a Muslim civil rights organization, yet neither it nor Omeish has said anything about Turkey's demand for Kanter's arrest. Erdogan has become a heroic figure among many Islamists, especially in the United States. Erdogan has supported Hamas, rejecting its labeling as a terrorist organization. Senior Hamas leaders have found safe haven in Turkey. Last year, Israel's Shin Bet accused a shadowy private military company, SADAT International Defense Consulting, of funding Hamas. SADAT is run by a top Erdogan military adviser, retired Brig. Gen Adnan Tanrivierdi, who wrote a manifesto 10 years ago calling on Muslim nations to use military force against Israel. Erdogan also supports the Muslim Brotherhood in Egypt, and numerous exiled group members use Turkey as a base. CAIR Executive Director Nihad Awad enjoys close relations with Erdogan's regime. Days after the coup attempt, Awad offered his prayers and thanksgiving for the soldiers and civilians who sacrificed their lives to defeat it at a rally outside the White House organized by an Erdogan-linked front group called the Turkish American National Steering Committee (TASC). Omeish also has been supportive of Erdogan's Turkey, calling it a modern incarnation of the Ottoman caliphate, and endorsing Turkish expansionism. Esam Omeish (left) and Nihad Awad raise alarms over Jamal Khashoggi's disappearance during an October news conference. 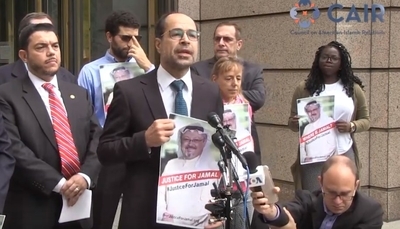 Both Omeish and Awad spoke at an Oct. 10 news conference about Khashoggi's disappearance. Awad demanded the United States investigate "to press for answers that will satisfy all of us. Jamal deserves protection because he's a free man and he has a free mind," Awad said. Kanter also is a free man with a free mind. But Kanter in 2017 posted a video comparing Erdogan – the authoritarian leader Awad, Omeish and their organizations support – with Adolf Hitler. He also has been outspoken against Erdogan's rendition of opponents from other countries, referring to the Turkish president as a dictator. Kanter's father was purged from a university in Istanbul last summer and faces up to 10 years in prison for belonging to the Gulenist movement. Kanter faced a domestic arrest warrant last year. Turkey also canceled his passport in 2017. Kanter grew up in the Gulen movement attending its schools since the second grade. His fears for his safety are not unfounded despite catcalls from Erdogan's supporters in Turkey who say that he's running a "smear campaign" against his home country. Turkish intelligence has kidnapped dissidents tied to the Gulen movement in Mongolia, Kosovo, Moldova, Gabon and Ukraine in recent years, including at least 100 people in Europe alone. The German press reported that a Turkish spy allegedly plotted to kill two Kurdish dissidents in Bremen in 2016. German-based Kurdish dissident Yüksel Koç told Spiegel Online in 2017 that a Turkish secret agent told him that his name was on a hit list assembled by Erdogan. Two Muslim dissidents have been targeted for harm by leaders of Muslim majority countries. Only one, Jamal Khashoggi, receives attention and support from American Islamists. The situational outrage shown by ignoring Kanter's plight is telling.